The 288-kilogram (635 pound) haul was found at Kuala Lumpur International Airport last Friday in 12 boxes labelled as oyster shells on the waybill. 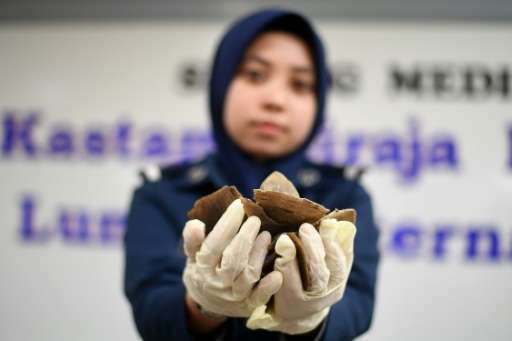 The scales worth around 3.69 million ringgit ($870,000) arrived from Ghana on a Turkish Airlines flight, the customs department said in a statement. The scales of the endangered pangolin, the world's most heavily trafficked mammal, are highly prized in Vietnam and China where they are misleadingly touted as having medicinal properties. Malaysia last month made its largest haul of such scales, 712 kilograms estimated to be worth more than nine million ringgit. Four pangolin species can also be found in Africa. Increasingly they are smuggled to Southeast Asia from Africa, but the majority go to China. Soaring demand has seen an estimated one million pangolins plucked from Asian and African forests over the past decade.